Camry 5th & 6th Gen (2002-2006 & 2007-2011)/2nd Gen Solara (2004-2008) Toyota Camry Discussion for years 2002-2006 & 2007-2011, as well as Solara Discussion for years 2004-2008. Topics of discussion range from fuel economy, safety, modifications, performance all involving America's favorite family car, the Toyota Camry. disclaimer ToyotaNation may or may not endorse various DIY projects such as this one, but all DIY projects are purely "at your own risk". If you are at all uncomfortable or inexperienced working on vehicles (especially electronics and mechanical), please reconsider doing the job yourself. It is very possible on any DIY to void your factory warranty, disable a safety feature, create a hazardous condition, or harm or even kill yourself or others. Examples would be the vehicle failing on you, getting an electric shock, or disabling an airbag to name a few. so i decided to change my serpentine/accesory belt. i thought i'd share a little info while i was at it. my car is a california 2003 toyota camry LE 2az-fe. instructions apply to most 2az-fe fwd cars, including gen5/5.5 camry, gen 6 camry, and scion tC. i'm not sure about the 2az-fe highlander and rav4. 2az-fe serpentine belt (i chose goodyear gatorback #4070763 which is around $29.99). racheting socket wrench (the longer, the more leverage, the better). 19mm socket (for your wrench). mechanic/working gloves (optional for extra grip). beverage of your own choice (keep out of engine bay of course ). ^this page is necessary since it contains the pattern in which the belt should follow. first off, take a good look at the belt and memorize the belt routing and how all the smooth pulleys are in contact with the smooth side of the belt, and all the ribbed pulleys are in contact with the ribbed side of the belt. there are two ways to take off the belt; you can either loosen the tensioner and simply slip off the belt off the alternator pulley (the most accesible pulley imo), or you can loosen the tensioner and just cut the belt, and take the risk of the belt slapping you in the face pretty hard due cuz you wrongfully thought you gave all the slack it could . use the 19mm socket wrench on the indicated bolt in the diagram and pull it clockwise towards the front of the car. this requires a bit of effort- it may seem like it's stuck, but the hydraulic tensioner is really just that hard to budge *this is where the long wrench is desired*. you'll be able to see the belt give slack when you give it enough leverege- that's when you simply yank off the belt off the alternator pulley or whatever pulley you want. pretty straightforward. I used an 18" breaker bar on the tensioner. I think what you have to remember is that the tensioner is hydraulic, not a spring. It doesn't move very fast since you are working against hydraulic pressure. Slow steady pressure will be enough. At least for me. ^good note on the tensioner and what to expect. Good info. For the Drive bolt, was easy to put it back? with the diagram, the drive bolt is supposed to be removed. i had no trouble or setbacks by not removing the drive bolt, therefore i did not include the removal/re-install of the drive bolt in my instructions. any pulley removal is an extra step that's not needed in my opinion. 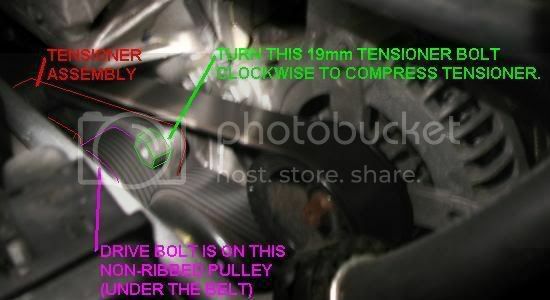 where are the drive belt tensioner and the drive bolt in the picture? is the tensioner you are talking about just below the belt? with the belt off, this is a good time to check that the alternator, water pump, and a/c compressor pulley are able to rotate freely (don't rotate too much- just check). they also shouldn't be loose or be able to wobble. with the old belt off, you pretty much reverse step 2, starting with putting the belt around all the pulleys (according to diagram) but the alternator pulley or tensioner pulley. make sure the belt is centered on all the pulleys (except the pulley yet to be wrapped around of course), especially the sections where it's rib-to-rib. place the socket wrench back on that 19mm bolt and pull clockwise towards the front of the car once again to release the tension. don't use anything to pry the belt on any pulley, because you may bend one of the pulleys or whatnot. with enough slack, you can put the belt back on. It really helps to have two people doing this because of the amount of force required to move the tensioner. You also omitted a lot of steps such as removing the front passenger wheel, wheel well liner, engine mount, and engine cover. 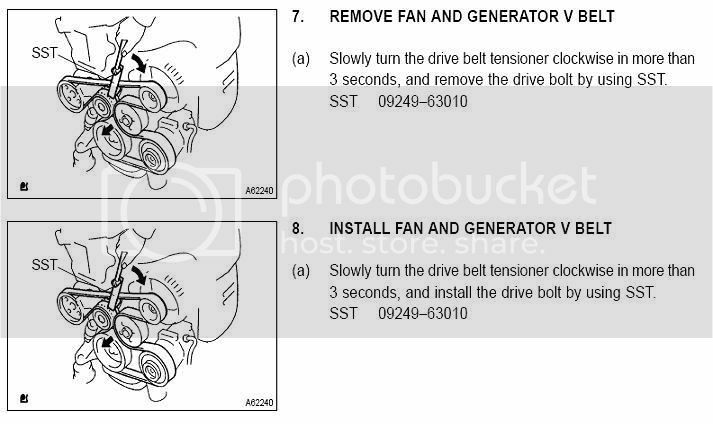 another person can help by compressing the tensioner, while the installer is using two hands to position the belt. on the other hand, i managed to do it by myself in under 10 minutes, and i don't consider myself an extremely strong person. but another person significantly can help no doubt. check that the belt is on correctly. store all tools. consume beverage of choice. recycle. Last edited by JustAnotherAsian; 09-08-2009 at 03:42 PM. great step by step! Very clear on the instructions! It really helps to have two people doing this because of the amount of force required to move the tensioner. You also omitted a lot of steps such as removing the front passenger whee, wheel well liner, engine mount, and engine cover. Good info. For the Drive bolt, was it easy to put it back? Last edited by Camry5genrocks; 09-13-2007 at 09:17 PM. It's not like the Gen 4. The mount is ABOVE the belt. The belt doesn't go through it so all of that isn't necessary. I wonder if someone will actually ever use the search to find it? If they do, they'll be happy with what they find. ^i guess. i did it all by myself with a racheting socket wrench from my $5 socket wrench kit from pepboys i got 2 years ago, 19mm socket, a small towel (for sweat), and bare hands just a few hours ago in the parking lot in front of autozone. i had one hand pushing the wrench towards the front of the car, and one hand jiggling the belt onto the alternator pulley. took me 10 minutes total. honestly though, it took a little sweat to get that tensioner budging. the majority of the time was spent constantly realigning the belt on the pulleys- everytime i thought i was almost done (before the final pulley of course), the belt is actually not on. not that frustrating, but it was noon high sun, pretty hot outside, and i was practically working with my face next to an oven because my engine was still hot. another person could be a significant help by pushing on that said wrench with two hands, and someone else installing the belt with two hands. even better if you have an extremely long wrench or breaker bar for more leverage like i indicated. nah. i wrote it just like how i did it, if not more since i didn't have the long wrench, breaker bar, gloves, or even a beverage of choice. removing the front passenger wheel and wheel well liner is not necessary imo (or in my case rather). i have big hands with long fingers that can span 10 inches thanks to piano, drums, and guitars since age 4- my hands fit between the wheel well and the pulley/belt system with no problem. and removing the engine mount? eh? i'll take a look at that next time, but i have no idea how to do that, nor do i initially think it would make the job easier. overall, i guess i'll make some changes to my original DIY- i'll include what you said as suggestions. i also forgot to give whitechocholate some cred on this cuz he sure saved me some dough. with the diagram, the drive bolt is supposed to be removed. i had no trouble or setbacks by not removing the drive bolt, as indicated in my instructions (or lack to say it needs to be removed). i moved/compressed the tensioner, got the belt out, and relesed the tensioner back. i moved/compressed the tensioner, put the new belt in, a released the tensioner back. the pulley removal is an extra step that's not really needed in my opinion. anyways, thanks for pointing that out. i'll also add that bit in the diy. Last edited by Camry5genrocks; 09-13-2007 at 08:52 PM. sure you can host the pic on your own photobucket. Very nice update you did with that pic! You forgot the step where you removed the transmission.